R. Daniel Kelemen. 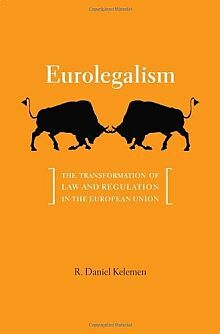 Eurolegalism : the transformation of law and regulation in the European Union. Harvard University Press, 2011. Despite western Europe’s traditional disdain for the United States’ “adversarial legalism,” this book argues that the European Union is shifting toward a very similar approach to the law. The author contends that the EU’s fragmented institutional structure and the priority it has put on market integration have generated political incentives and functional pressures that have moved EU policymakers to enact detailed, transparent, judicially enforceable rules—often framed as “rights”—and back them with public enforcement litigation as well as enhanced opportunities for private litigation by individuals, interest groups, and firms. Nancy J. King, Joseph L. Hoffmann. 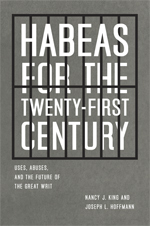 Habeas for the twenty-first century : uses, abuses, and the future of the great writ. University of Chicago Press, 2011. For centuries, the writ of habeas corpus has served as an important safeguard against miscarriages of justice, and today it remains at the center of some of the most contentious issues of our time—among them terrorism, immigration, crime, and the death penalty. Yet, in recent decades, habeas has been seriously abused. In this book, the authors argue that habeas should be exercised with greater prudence. They examine the current use of the writ in the United States and offer sound reform proposals to help ensure its ongoing vitality in today’s justice system. Colin Dayan. The law is a white dog : how legal rituals make and unmake persons. Princeton University Press, c2011. Jack M. Balkin. Constitutional redemption : political faith in an unjust world. Harvard University Press, 2011. C. E. Rhodes, Jr. Success strategies and key lessons for young lawyers, 2010. State Bar of Texas, c2010. Brandon L. Garrett. Convicting the innocent : where criminal prosecutions go wrong. Harvard University Press, 2011. Peter J. Henning, Lee J. Radek. The prosecution and defense of public corruption : the law and legal strategies. Oxford University Press, c2011. Is the death penalty dying? : European and American perspectives / edited by Austin Sarat, Jürgen Martschukat. Cambridge University Press, 2011. Kern Alexander, M. David Alexander. American public school law. 8th ed. Wadsworth Cengage Learning, 2012. Dean A. Beers. Practical methods for legal investigations: concepts and protocols in civil and criminal cases. CRC Press, c2011. David A. Schlueter, John F. Onion, Jr., Edward J. Imwinkelried. Texas evidentiary foundations. 4th ed. LexisNexis, 2011. The evolving international investment regime : expectations, realities, options / edited by José E. Alvarez, Karl P. Sauvant. Oxford University Press, c2011. Jonathan P. Wyatt, et al. Oxford handbook of forensic medicine. Oxford University Press, 2011. Mikael Eriksson. Targeting peace : understanding UN and EU targeted sanctions. Ashgate, c2011. International arbitration court decisions / edited by Stephen Bond, Frédéric Bachand. 3rd ed. Juris, c2011. David E. Strecker. Labor law : a basic guide to the National Labor Relations Act. CRC Press, c2011. Cynthia Lewis, et al. State documents bibliography, Vermont : an updated guide to the Vermont legal system. 3rd ed., rev. American Association of Law Libraries, 2009. Donna Nixon, Nichelle Perry, Jason R. Sowards. Guide to North Carolina legal and law-related materials. 3rd ed. American Association of Law Libraries, Government Documents Special Interest Section, c2010. Martin J. Alperen. Foundations of homeland security : law and policy. John Wiley, c2011. Cynthia M. Ho. Access to medicine in the global economy : international agreements on patents and related rights. Oxford University Press, c2011. Stefan Luginbuehl. European patent law : towards a uniform interpretation. Edward Elgar, c2011. When governments break the law : the rule of law and the prosecution of the Bush administration / edited by Austin Sarat, Nasser Hussain. New York University Press, c2010. Judith Armatta. Twilight of impunity : the war crimes trial of Slobodan Milosevic. Duke University Press, 2010. Serena Mayeri. Reasoning from race : feminism, law, and the civil rights revolution. Harvard University Press, 2011. Congressional Oversight Panel January oversight report : an update on TARP support for the domestic automotive industry. U.S. G.P.O., 2011. The future of housing finance : a review of proposals to address market structure and transition : hearing before the Committee on Financial Services, U.S. House of Representatives, One Hundred Eleventh Congress, second session, September 29, 2010. Legislative proposals to reduce greenhouse gas emissions : an overview : hearing before the Subcommittee on Energy and Air Quality of the Committee on Energy and Commerce, House of Representatives, One Hundred Tenth Congress, second session, June 19, 2008. The recent salmonella outbreak : lessons learned and consequences to industry and public health : hearing before the Subcommittee on Oversight and Investigations of the Committee on Energy and Commerce, House of Representatives, One Hundred Tenth Congress, second session, July 31, 2008. Long-term care insurance : are consumers protected for the long term? : hearing before the Subcommittee on Oversight and Investigations of the Committee on Energy and Commerce, House of Representatives, One Hundred Tenth Congress, second session, July 24, 2008. Science under siege : scientific integrity at the Environmental Protection Agency : hearing before the Subcommittee on Oversight and Investigations of the Committee on Energy and Commerce, House of Representatives, One Hundred Tenth Congress, second session, September 18, 2008. The financial crisis inquiry report : final report of the National Commission on the Causes of the Financial and Economic Crisis in the United States / submitted by the Financial Crisis Inquiry Commission pursuant to Public Law 111-21. U.S. G.P.O., 2011. Tracking the money : preventing waste, fraud, and abuse of Recovery Act funding : hearing before the Committee on Oversight and Government Reform, House of Representatives, One Hundred Eleventh Congress, first session, July 8, 2009. Following the money : report of the Special Inspector General for the Troubled Asset Relief Program (SIGTARP) : hearing before the Committee on Oversight and Government Reform, House of Representatives, One Hundred Eleventh Congress, first session, July 21, 2009. The silent depression : how are minorities faring in the economic downturn? : hearing before the Committee on Oversight and Government Reform, House of Representatives, One Hundred Eleventh Congress, first session, September 23, 2009. Crimes against humanity : when will Indonesia's military be held accountable for deliberate and systematic abuses in West Papua? : hearing before the Subcommittee on Asia, the Pacific, and the Global Environment of the Committee on Foreign Affairs, House of Representatives, One Hundred Eleventh Congress, second session, September 22, 2010. Oversight of the U.S. Department of Homeland Security : hearing before the Committee on the Judiciary, United States Senate, One Hundred Eleventh Congress, second session, April 27, 2010. Ensuring the safety of human spaceflight : hearing before the Subcommittee on Space and Aeronautics, Committee on Science and Technology, House of Representatives, One Hundred Eleventh Congress, first session, December 2, 2009. Administration of the Freedom of Information Act : current trends : hearing before the Subcommittee on Information Policy, Census, and National Archives of the Committee on Oversight and Government Reform, House of Representatives, One Hundred Eleventh Congress, second session, March 18, 2010. Interoperability for public safety radio equipment : hearings before the Subcommittee on Technology and Innovation, Committee on Science and Technology, One Hundred Eleventh Congress, second session, May 27, 2010 and September 23, 2010. Hitler's shadow : Nazi war criminals, U.S. intelligence, and the Cold War / Richard Breitman and Norman J.W. Goda. National Archives and Records Administration, 2010.